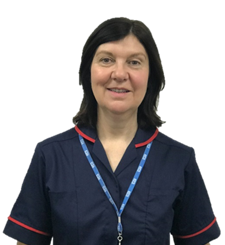 Fiona Milner works for Lincolnshire Community Health Services as a specialist nurse within the safeguarding team, as Domestic Abuse Lead. After qualifying as a nurse in 1984 she became midwife, then health visitor and mental health practitioner. In her current role she trains staff within the trust on domestic abuse, supports staff in dealing with disclosures from patients, staff and carers, and ensures they follow best practice guidelines. She is involved in the local domestic abuse joint working groups with partner agencies, and is an active Royal College of Nursing member on the Women’s Health Forum. The feeling of making a difference; if a health worker has engaged with a patient, utilised their training on domestic abuse and enabled them to move away from abusive situations or when there are opportunities to influence the wider domestic abuse agenda locally or nationally, I get a real feeling of having made an impact for good, which is what most people want to achieve I guess. What do you see as the role of Health services in the response to domestic abuse? Health workers are ideally placed to respond to domestic abuse situations, they have access to many strands of the public not just those in hospital or presenting with injuries indicative of possible domestic abuse. Asking the question either in routine enquiry or indicator based asking is embedded in our Trust and has enabled us to respond to many victims/survivors who would have gone unsupported or not been aware that they were being abused – such as in cases of coercion and control. A good team, supportive managers and recognising the need for a bit of self-care. 2. Working on the RCN Resource Pocket Guide for Domestic Abuse which is now out and in circulation with excellent practical information for health staff who need quick on the spot information. I love my job and feel so proud when I get time to reflect on it like now.